How to explain the death of pets to young children. How do you explain to young children that their pet has died? Coping with the grief of losing a pet yourself is so difficult, add to that the confusion from children about where their beloved Rover has gone and it’s sad times all round. Pets are part of the family too and when they go it leaves a big, sad void. Adults joke a lot about ‘flushing the fish’, me included, but for a 7 year old the pain of that loss is very real and one that we’ve recently just been through. The heartbroken little face looking at you through a face full of tears asking “Why?” is enough to make the hardest of hearts crumble. Regardless of whether you’ve lost a small goldfish or a large dog, losing a pet is just not easy. Our family dog died 4 years ago, I still miss him. Step up to the mark, Janet Peel, a friend of mine who is currently enjoying celebrity status in our region and beyond. At some point I think we’ve all said, after an inspiring incident, that “Ooo, I should write a book.” Well, Janet didn’t just say it, she did it! 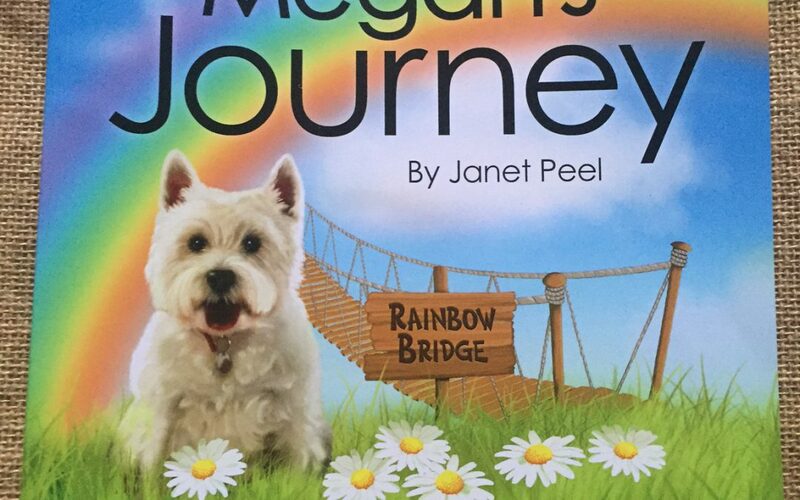 Megan’s Journey follows the, funnily enough, journey of Megan the Westie who dies and wakes up at The Rainbow Bridge to be re-united with her brother Max. I got a bit teary reading through this, especially the bit where Megan is shown a way to let her human family know that she is there in spirit, and I can see how it will be a big help as this beautiful story will really console young children and give them the tools to cope with their loss a little bit better. I have one copy of this book up for grabs, to enter the competition follow the Rafflecopter below. See Janet be interviewed by Granada Reports right HERE. Update – 7th March 2017 – This competition is now closed but if you’d like to buy a copy of Janet’s book then CLICK HERE.